It eliminates the need to pump an inflatable or remain in either a stationary or floating position. It allows you to do both in one chair and also offers attachable accessories that previous Cool Pool Chair Link users requested (patented accessories not included on current Cool Pool Chair). Note: we also have the registered Trade Mark for COOL POOL CHAIR. Existing products are either an inflatable or non-inflatable and requires the user to inflate and/or sit on top or partially submerged in water. This patented water chair with accessories allows you to sit upright partially submerged in water along the side of a pool, dock or boat or float upright or reclined in water. In addition the patent includes built-in, attachable and floatable accessories such as a tray for food/drinks/personal items, umbrella or water spray mister. The benefits of this chair is the versatility and multifunctional uses - stationary along a wall in any body of water or floating upright or reclined and with built in accessories for added convenience. No current in-water lounger or chair offers all these choices in one novel chair! The enhanced patented version of the current Cool Pool Chair will significantly reduce the cost to mfr., enhance the current look and feel, and add attachable accessories current users of the Cool Pool Chair have requested. We are open to negotiate a licensing agreement or sale of the patent and/or TM. 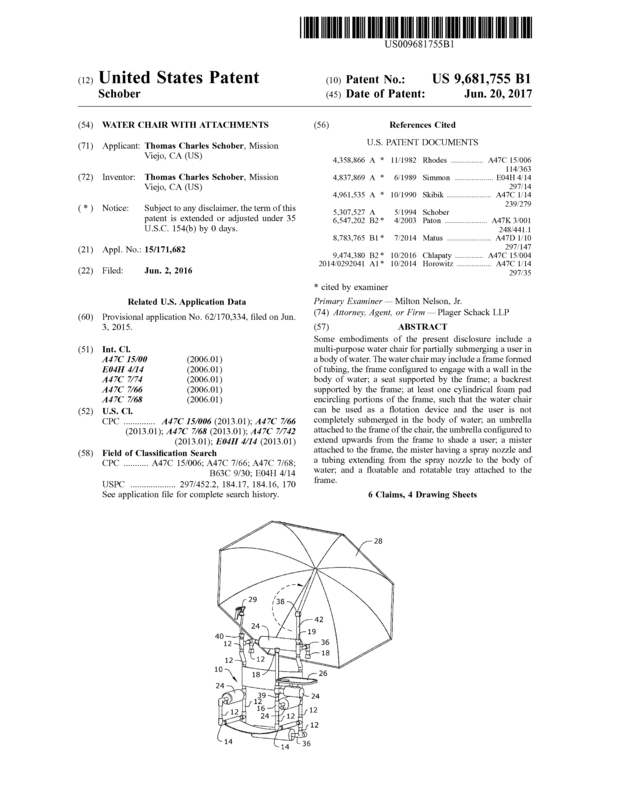 Page created at 2019-04-23 6:39:15, Patent Auction Time.